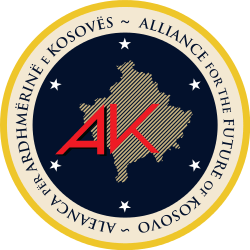 The Alliance for the Future of Kosovo (Albanian: Aleanca për Ardhmërinë e Kosovës, AAK) is a political party in Kosovo. It was formed on 29 April 2001. The current president of the party is Ramush Haradinaj. In December 2004 the parliament elected him as Prime Minister of Kosovo and he formed a coalition government with the largest party, the Democratic League of Kosovo (LDK). He resigned as Prime Minister in March 2005 after learning that he had been indicted by the International Criminal Tribunal for the former Yugoslavia, for 37 counts of war crimes. He received a full acquittal from the Tribunal on 3 April 2008. He returned to Kosovo and immediately resumed his duties as president of the party. The AAK currently has three deputy presidents: Blerim Shala, Naim Maloku and Ahmet Isufi. The current Secretary General is Burim Ramadani and the Secretary of Organisation is Ibrahim Selmanaj. At the last legislative elections held on 17 November 2007, the alliance won 9.6% of the popular vote and 10 out of 120 seats in the Assembly of Kosovo, which made it the fifth largest political force. This was a gain on the previous two legislative elections in 2001 and 2004 in which the AAK won 7.8% and 8.4% of the popular vote, respectively. The AAK's eleven current members of parliament are: Ardian Gjini, who is the leader of the parliamentary caucus, Ahmet Isufi, Daut Haradinaj, Kimete Bajraktari, Burim Ramadani, Bali Muharremaj, Donika Kadaj, Blerim Shala, Teuta Haxhiu, Ramiz Kelmendi and Time Kadrijaj also serves as the AAK's member of the Assembly Presidency. At the municipal elections held on 17 November 2007, the AAK gained control of 3 municipalities in western Kosovo: Peć, Đakovica and Deçan. At the municipal elections held on 15 November 2007, the party gained 8 of 37 municipalities of Kosovo. AAK is located slightly to the right on the political spectrum. The party flag is red, black and white. White represents peace; red and black are the national colours of the 90% Albanian majority of Kosovo. The choice of the party's name, Alliance for the Future of Kosovo (AAK) is explained in Ramush Haradinaj's second book. Whereas previous Kosovo party acronyms began with consonants, a vowel was chosen for AAK because it seems less harsh and more open. The word "future" was chosen to mark a break with the old communist tendency to reflect backwards upon one's history. Finally, "alliance" was chosen because of its association with the NATO alliance which is much revered in Kosovo for its intervention in the Kosovo War of 1999, and also because of it evokes the idea of working together to achieve one's aims. 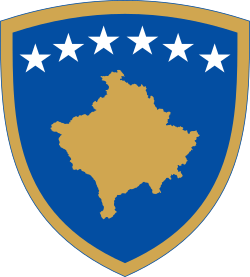 ↑ "Kosovo: early elections to be held June 8". ANSA. 8 May 2014. Retrieved 8 June 2014. ↑ Birnbaum, Ben (19 October 2010). "Kosovo's 1st ballot since break from Serbia". The Washington Times. Retrieved 8 June 2014.